Ping Sigma G Anser putter. 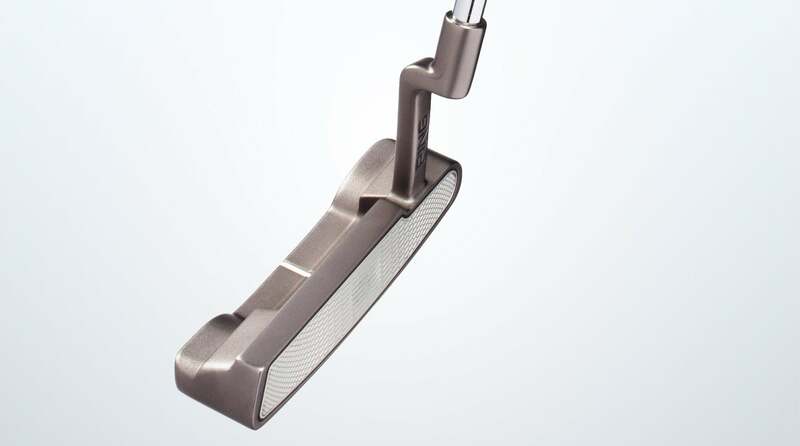 Ping engineers combined all of their R&D know-how into this putter series (hence, the Sigma name). Made from 17-4 stainless steel, the flat sticks feature aluminum inserts that cover the entire face and are backed by Pebax elastomer (used in athletic shoe soles) to improve sound and feel. The new milled TR (True Roll) variable-depth groove pattern produces similar ball speeds (and distance) on center and off-center contact. "The combination of the high-grade elastomer and fully machined aerospace-grade aluminum over the entire face delivers an amazing feel and sound," said Ping’s Chairman and CEO John A. Solheim. "And with improved ball-speed consistency and forgiveness, golfers will make more putts than ever." The Sigma G family consists of sixteen styles -- blades, mallets and counter-balanced options -- in a platinum or nickel finish to suit a range of strokes and styles. The Anser model is available in both finishes. Grip options include Ping’s polyurethane-wrapped pistol in midsize or oversize, while the company’s 130-gram CB60 is standard on counterbalanced models. The clubs will be in stores February 16. $180 for blades; $200 for mallets; $220 for counterbalanced.